Two-piece dresses, jumpsuits, and bathing suits are so IN right now (yes, two-piece bathing suits are always in during the summer, but still), and Gigi Hadid just rocked the trend in a green tracksuit. Leave it to Gigi to make monochrome street style look like it deserves to be on a runway. This isn’t the first time Hadid has made sweatpants look straight-up high fashion, and the look is definitely reminiscent of Cara Delevingne’s all-green sweatsuit she wore last fall. Gigi’s crop-top hoodie and matching pants — in a faded shade of green! — is quickly becoming our new go-to summer look. Want Gigi’s look? The supermodel is wearing the Milan Suit in Sage Dust by Cotton Citizen. The top is the Milan Crop Pullover Hoodie (though Hadid cut the sleeves off) and it will run you $225. On the bottom she’s rocking the Milan Joggers, which are also $225. 1. Calvin Klein tracksuit from Urban Outfitters. This cropped and cut Calvin Klein hoodie is very Gigi-esque and is only $49 from Urban Outfitters. And the pants are ON SALE for $39.99 right now at Urban. Oh yeah, look like a model even when you’re on a budget (it helps when the models are wearing monochrome tracksuits). 2. 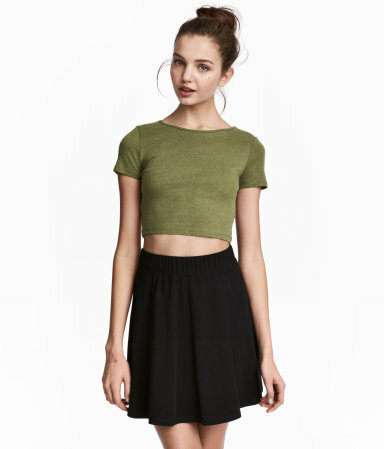 A top and bottom from H&M. These khaki green sweatpants that cost $19.99. 3. A Michael Lauren hoodie and pants set from Nordstrom. 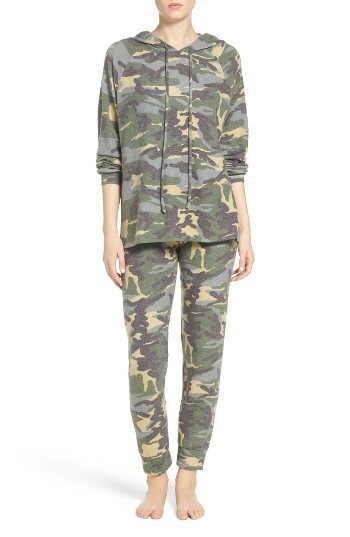 Since Gigi’s outfit has a camo look to it, this one’s a dead ringer for hers, at one-quarter of the price! Find it at Nordstrom for $110, and if you’re really channeling Gigi, you can cut the hoodie so it’s cropped like hers. We’ll keep taking notes from Gigi’s street style, since she is queen of the monochrome two-piece.